Pinkham Notch, NH – Wildcat Mountain is once again the last ski area in the granite state to be offering lift-serviced skiing and riding for a ninth season in-a-row. 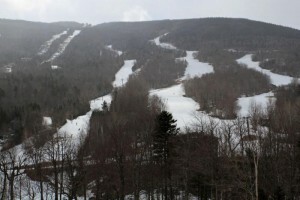 Following a brief weather closure on Tuesday and Wednesday, Wildcat re-opened Thursday upholding its reputation as New Hampshire’s spring ski area and is scheduled to operate through the weekend currently offering 21 trails and 2 lifts, including the high-speed Wildcat Express summit quad and the Snowcat triple chair. At this time, spring discount ticket rates are $49 for adults and $39 for young adults, juniors & seniors, but the area is offering a “Youth Pay Your Age” discount for ages 6-18 on Sunday, April 26. Wildcat Mountain is scheduled to be closed Monday, April 27 through Friday, May 1 and is planning to re-open again for the weekend of Saturday, May 2 and Sunday, May 3, conditions and weather permitting. Wildcat Mountain was the first ski area open in New Hampshire for the 2014/15 season and began operating back on November 9, 2014. Up-to-date information including snow report, spring ticket rates and discounts, and 2015/16 season passes on sale now and valid at all three New Hampshire Peak Resorts ski areas including Wildcat Mountain, nearby Attitash Mountain Resort and Crotched Mountain, is available at www.skiwildcat.com.